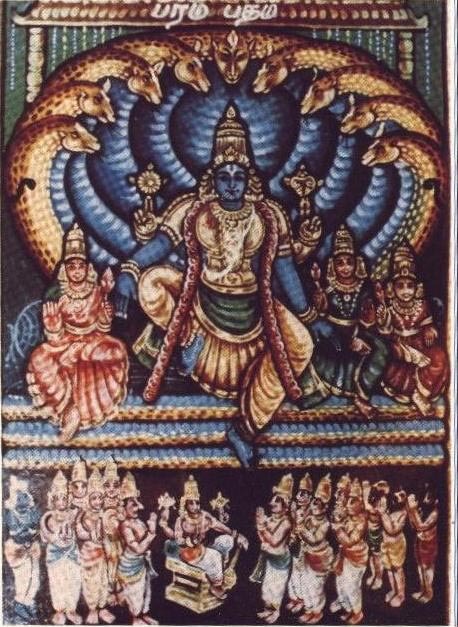 In the ninth pAsuram, parAnguSa nAyaki says to some big cranes “When you go to emperumAn, even if he does not come here, you can bring his message from there to me and repeat that everyday to sustain me”. nIrththirai mEl ulavi irai thErum pudhAvinangAL! pudhAvinangAL – oh big cranes! Oh big cranes who are moving around atop the water suppressing the tide, in search of prey! I who am having sin, not having any other saviour than you the unique ones; on seeing the supreme lord who is like huge clouds gathered during rainy season, who is very obedient to his devotees through his incarnation, and who is letting (such beauty) to be enjoyed by the residents of paramapadham, bring his message and shower your mercy upon me , come and reside here, and speak for a long time. pErththu maRROr kaLaikaN vinaiyAttiyEn nAn onRilEn – She has crossed the state of passing her time along with her associates. Even towards his devotees, one should manifest his hollowness. I have no other saviour than you. maRRu Or kaLaikaN – For sIthAp pirAtti, even in lankA, she had thrijadA; even when she was left alone in the forest, there was vAlmIkI bhagavAn; when the husband abandons, one should at the least have a father [she does not have any one]. vinaiyAttiyEn – Usually the husband will be the saviour; I am so sinful to have such husband abandon me. nIrth thirai mEl ulavi – The cranes are capable of crossing over the ocean surrounding the universe and the virajA river [which is the boundary between spiritual realm and material realm]. ulavi – They are moving around water as they would do on land. irai thErum – Just like their walk, their search for prey is also complete. While I am fasting here [not having emperumAn], you cannot consume your food; I will sustain only when I too have food like you. kArth thiraL mA mugil pOl kaNNan – All the fatigue will be removed when his divine form is seen! For her eyes – everything appears black. One who appears like a cluster of blackness; also said as a great cloud gathered around in rainy season. mA mugil – The cloud which can give continuously. kaNNan – His compassion inside the heart is [white/pure] unlike the black external form. viNNavar kOnaik kaNdu – While there are thirsty people here [in material realm], he is feeding water to fishes. On seeing the emperumAn who is presenting himself to nithyasUris who have no scope for separation from him. vArththaigaL koNdu – Even if he does not come, he would have something to say. More than seeing him, you are going to hear his words. AzhwAr is the one who says in thiruvAimozhi 4.7.3 “pAvi nI enRu onRu sollAy” (you are not telling me that I am a sinner). Now AzhwAr would even hear his words of refusal. How can I wait forever to hear from you? vArththaigaL – koNdaruLi – vandhirundhu – vaigalum – uraiyIr – You go to him once, hear his words, being merciful and come to me, uplift me forever by speaking about that to me! Alternative explanation – seeing krishNa, the lord of nithyasUris, hearing the words “mA Sucha:” (do not worry) which lead to the result, show your compassion towards me by coming here and share with me those words forever. This entry was posted in thiruvAimozhi, thiruvAimozhi 6th centum on May 14, 2018 by Sarathy Thothathri.